"Yummy, easy apple butter makes a great gift!" Place apple slices in a slow cooker. Stir sugar and apple pie spice with the apples. Cook on High for 4 hours; stir. Remove cover and continue cooking until the apples are very tender and most of the liquid has evaporated, 2 to 2 1/2 hours. 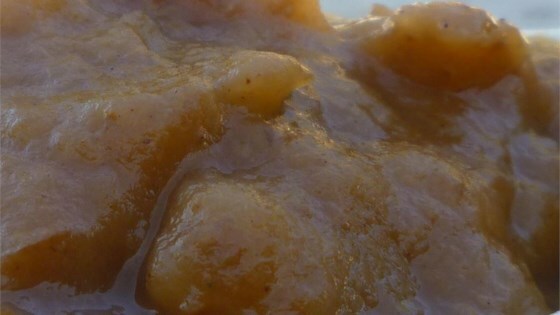 Scrape apple butter into a bowl; refrigerate 8 hours to overnight. Blend apple butter with an immersion blender until smooth. Alternately, you can run the butter through a food mill or blend in a blender. I combined the advice in the reviews with the original recipe, and it came out pretty good. I used both white sugar and Splenda brown sugar with Granny Smith apples. Yes, I add some ginger for a little kick.